With the festive season upon us, we'd like to wish all our readers, clients, friends and colleagues the happiest of holidays. 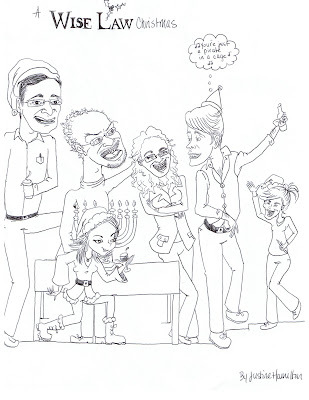 Merry Christmas, Happy Hannukah and Season's Greetings to everyone from all of us at Wise Law Office. 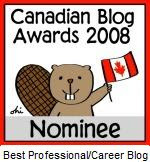 Steve Matthews, the mastermind behind the Canadian Law Blog Awards, has asked members of our nation's 'blawger' community to help him by proposing our nominees for this year's ClawBie Awards, presented to Canada's top law bloggers. As a very appreciative recipient of such recognition last year, I want to speak for a moment about the award, itself. The ClawBies are a different sort of award. Unlike most other awards, including the Canadian Blog Awards and the current ABA Top 100 Awards, which are essentially crosses between popularity contests and voter-turnout drives, the public does not currently participate directly in the outcome of the ClawBies. Rather, with Steve's call for nominations, they may be emerging as a straw-vote among law bloggers ourselves. In this way, the Clawbies may perhaps be seen as the 'Oscars' of the relevant blog awards, to the extent that it is our yet-unnamed and largely-unformed 'academy' that will acknowledge those most deserving of cudos. Steve's decision to ask the blawger community for nominations this year should represent a next step toward a conscious recognition that Canada's law bloggers do cumulatively represent a voice of increasing relevance within the legal profession and in the eyes of the public. No Canadian blogger has more ably demonstrated the influence of our new medium in the greater public discourse than Michael Geist, my first nominee for a 2008 ClawBie. As a vocal and persuasive critic of ill-conceived copyright reform legislation proposed last year by Stephen Harper's Conservative government, Mr. Geist successfully mobilized grass-roots opposition to the legislation via his law blog, media articles and the social media phenomenon, Facebook. In the process, however, Mr. Geist emerged as significantly more than an online organizer. When the dust settled and the impugned copyright bill was ultimately put to pasture in December 2007, it was apparent that Mr. Geist had not only assumed the role of the nation's moral conscience on intellectual property concerns - he essentially became the nation's unofficial Official Opposition on these issues, a role that continues to date. One common thread that runs through the best blogs is exceptionally good writing by commentators who speak their minds fearlessly, utilizing intelligent, challenging and highly entertaining voices that make you wonder what they'll have to say about any new issue as soon as it arises. Although Law Is Cool is a collective that doesn't have a single, defining voice, I think it generally delivers the goods as Canada's most consistently interesting and entertaining law blog. With subject matter that ranges wildly from strictly-student concerns to advocacy and politically-partisan treatises, Law is Cool is often first-out-of-the-gate with most legal and political developments of general concern, and is probably the site I click through and read most frequently. Aside from that, its writers have been called more names by Mark Steyn than I have. For that, I am eternally appreciative, and I gladly name Law is Cool as my second ClawBie nominee. The 'blawger' enjoys a special opportunity, apart from other blogs, to bring the law to the people. It never ceases to amaze me how adept my clients now are at sourcing high-level information about their legal concerns online. As a practitioner I can vouch that answers to my own research questions are often but a click away. Increasingly, the legal information required by the public and the profession can be found free of charge at the many Canadian law blogs whose raison d'etre is exactly that - to get information "out there." Lots of law blogs do this well. 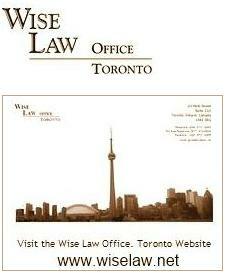 Hull and Hull's Toronto Estate Law Blog does it best. With ever-refreshing content in multi-media formats, I can't imagine that there is a better estate law resource in the nation for clients and lawyers alike. As a trailblazer that sets the standard for providing timely, topic-specific legal information to the public-at-large in various media formats, Hull and Hull has my third nomination for a 2008 ClawBie. Given the task of naming three nominees, those are mine. 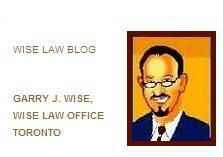 But are they really Canada's best law blogs, worthy of mention apart from their many peers? I suppose I cast my votes for Canada's overall best law blogs when I launched Wise Law Reader a few short weeks ago, featuring many of the key writers I follow regularly. And even so, I haven't finished adding sites. The Court, Slaw, and Jordan Furlong's Law 21 are among the most frequently-recognized and discussed law blogs in Canada. All three are must-reads. But comprised largely of academics, legal marketers and legal philosophers, these sites don't always provide the ears-to-the ground immediacy found at practitioner blogs like Stan Rule's Rule of Law, the ICBC Law Blog, Canadian Privacy Law Blog and the indispensable Cavanaugh Williams Insurance and Litigation News blog, easily Canada's smartest lawyer-to-lawyer case law blog. Also worthy of mention is Donna Seale's Human Rights in the Workplace, one of the many newer blogs that is becoming an important, contributing voice to Canada's online legal landscape. It's increasingly tough to consider Canada's legal 'blawgosphere' as a monolithic entity, as there are now so many different types of offerings. There are practitioner blogs, such as our own, written primarily by practising lawyers. There are academics' blogs and law student blogs. There are those written by journalists, and those by professionals who provide important support services to the legal profession. Our common thread is simply that all sites' discussions focus largely on trends in the law and developments in the legal marketplace, as a whole. Cumulatively, there is a lot of good reading out there. And it keeps getting better. Congratulations to all on a great year for Canadian law blogs, and our best wishes to Steve Matthews as he begins his 2008 deliberations. Constitutional lawyer and leading progressive blogger, Glenn Greenwald, visited Bill Moyers this week, and discussed 9-11, unitary executive theories, and the constitutional excesses of the Bush Administration. Mr. Greenwald asserts that failing prosecution of high-ranking Bush government officials who broke the law by engaging in warrantless wiretapping, torture and suspension of habeas corpus rights, America will essentially have adopted a two-tiered justice system that subjects ordinary Americans to the harshest form of "three strikes" criminal sanctions but wholly exempts the ruling elite from any criminal accountability at all. Also see Part I and Part III of the interview at YouTube. I've previously tacked this issue in our November 4th post, On Greenwald, and Kerr and the Chicanery of the Intellectual Right. I continue to ponder the degree and kind of accountability that must be demanded of the soon-to-be-former Bush administration for its reckless disregard of basic human rights in the guise of the marketing operation formerly known as the War on Terror. I have great concern that if the new Obama administration pursues such accountability via congressional investigations or criminal law processes, it will tie itself, Congress and the nation in all-too-familiar knots. Beyond that, by doing so it may simply re-energize the partisan warfare that has so embarrassingly eroded the effective working of the federal government since the Clinton impeachment fiasco. The international standing of the United States, however, will not be restored by an Obama America that turns a blind eye to the Bush administration's legacy of torture, unlawful detention and rendition, domestic and international invasion of privacy and ongoing manipulation of the civil and military judicial systems. In the absence of an unambiguous and total rejection by American lawmakers and Courts of the outrages that have blackened America's standing among its greatest allies, the world will properly be entitled to assume that not much has really changed, at all. ...I do not anticipate that Mr. Obama will seek to restore America's place as a shining beacon by way of an international charm offensive, alone. America is beginning to wake up to the reality that among his many gifts, their next President has considerable skill in walking the walk. One of his many challenges, however, will be to establish a process for review of the sins of the past that will not limit the country's ability to move forward toward the promise of a better tomorrow. Divorce, Sharia Style, a British TV documentary, looks at Britain's Sharia councils and asks "whether religious laws should be recognized by the secular British legal system:"
Significant changes were announced today by Ontario Attorney General Chris Bentley that may revolutionize the way civil claims are handled in Ontario's court system. The streamlined simplified procedures in Ontario Superior Court's will apply in cases where up to $100,000.00 is claimed, up from the current $50,000.00 ceiling. The new regulations will also establish limits to a party's entitlement to extended examinations for discovery in Superior Court proceedings. Under the proposed legislation, all discovery by a party is to be confined to one day, unless agreement is reached or an Order is obtained permitting extended discovery. See the Attorney General's news release on the initiative, for additonal backround. The proposed changes are intended to tackle the access to justice problems that have plagued the Province's court system. "This will provide greater access to justice to all Ontarians and to all Ontario businesses," Bentley said during a news conference at the Law Society of Upper Canada. It was attended by several high-ranking judges and prominent litigators who have been pressing for reforms to the civil justice system to make the cost of going to court more affordable. I can respect the good intentions behind this initiative. I am not particularly sold, however, on the notion that a leaner justice system will ultimately prove to be a wiser system. Certainly, the Small Claims Court sytem will require a massive overhaul, in terms of infrastructure and court procedures, to prepare for the exponentially more complex and voluminous caseload that lies ahead. Will mandatory mediation be preserved for cases in the new system? Certainly, there has been no tool more effective in achieving expedited and cost-effective dispute resolution. I'll review the new legislation in entirety before commenting further, but for now, I'm more than a bit skeptical of a civil procedure system that elevates cutting corners to the level of a primary, organizing principle. Are there really any shortcuts to justice? Neil Young, the ageless Canadian rocker who made two sold-out appearances at Toronto's Air Canada Centre this week, isn't well-known for factoring in his audience's preferences when choosing his set-lists. This year's edition of Mr. Young, however, sent no-one home unhappy. His two-hour-plus concert Thursday evening featured a retrospective of career highlights, including the classics Everybody Knows this is Nowhere, Cowgirl in the Sand, Needle and the Damage Done, Old Man, Heart of Gold, the anthemic Rocking in the Free World, a hypnotic Cortez the Killer and his signature ode to punk rocker Johnny Rotten, My My Hey Hey. But songwriting prowess aside, it was his unyielding tenacity on stage that was most remarkable. At 63, and apparently recovered from serious medical challenges in recent years, Mr. Young remains possessed of an intensity that simply defies his age. Unlike his contemporary, Bruce Springsteen, whose onstage toils often conjure up the illusion that rock and roll indeed is the elixir of eternal youth, Mr. Young simply transcends all notice of chronological age and passage of time. He just is what he is. And always has been. He remains wholly remarkable. Capping off a week that brought a Grammy nomination and the release of a new album, Sugar Mountain, he continues to inspire and grow creatively. He was in rare form on Thursday, moving seamlessly from grunge to folk to twang and back, and while I've seen him more times than I can count, this will be one concert to remember. MSNBC's Rachel Maddow chimes in on Stephen Harper's efforts to "banish the enemy:"
What's going on in Ottawa?